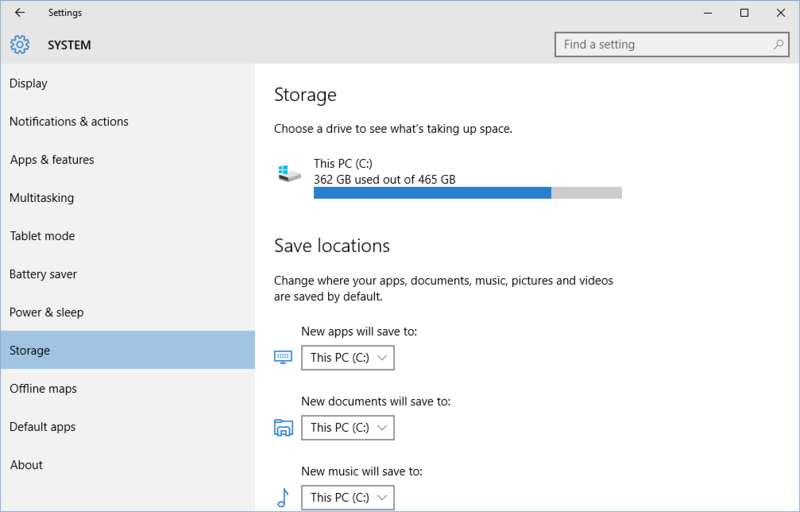 Windows 10 has a great high-level tool to analyze what's taking up all that drive space. Here's how to use it. Managing hard drive space is always a pain. Who among us doesn’t regularly check out the little blue line for the “C” drive in File Explorer to see how much space is left for a new game, movie...whatever? 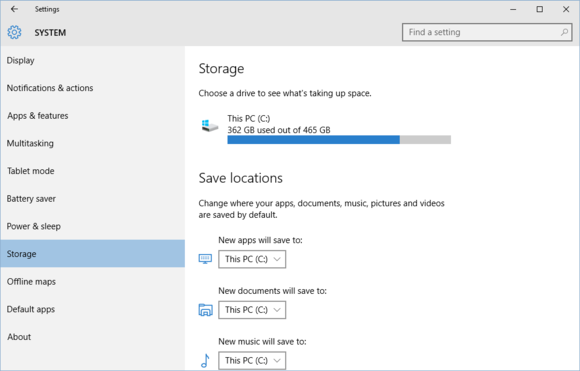 But in Windows 10, that little blue line is just the beginning when it comes to seeing what’s sucking up your storage. The operating system includes a new way to drill down deeper and figure out how much space you have left on your drive, and where you can make room. The new feature is in the Settings app under Start > Settings > System > Storage. At the top of the screen you’ll see the familiar blue line showing how much storage you have left and how much you’ve used. 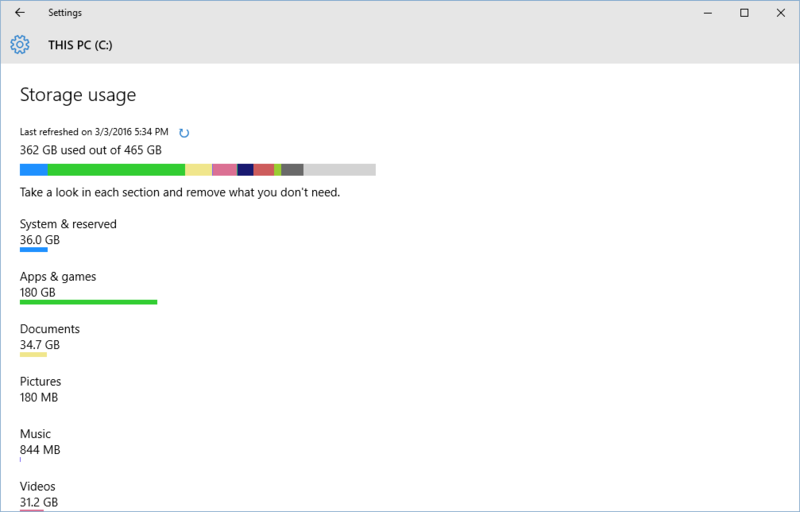 That’s nothing new, but clicking on that reveals a detailed breakdown of your storage usage very similar to the Windows 8.1 disk space feature. It shows all your disk usage based on the various folders you have on your PC. In Windows 10, however, clicking on each of those segments brings you to a new screen where you can manage those particular file types on your hard drive. Clicking the Apps & Games section right at the top, for example, shows a list of any Windows Store apps, desktop software including plugins, and games you’ve installed on your PC. This is the section of the settings app that doubles as the Control Panel’s “uninstall programs” section. By default the apps and games list is sorted by name, but you can also choose to sort it by size or install date. Click on an individual item and you’ll see an option to uninstall it from your system. Going back to the main storage settings screen, you can also drill down into your various folders. Unlike the Apps & Games section, you won’t see a list of all your pictures or all your music if you click on these items. Instead you’ll be taken to a (mostly useless) screen with a View [pictures, music, documents, etc.] 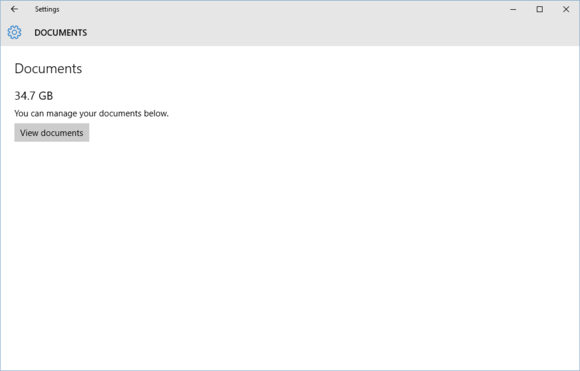 button that launches File Explorer. The few exceptions to that are down at the bottom, where you see options for Temporary files and Other. Click on Temporary files and you’ll be able to delete any temporary files on your PC, empty the Recycle Bin, or view your downloads folder. Click on Other and you see yet another list of miscellaneous folders on your PC taking up significant space, such as a virtual machines folder or GPU drivers. Click on any item within the Other list and you’ll once again launch File Explorer to manage your files. 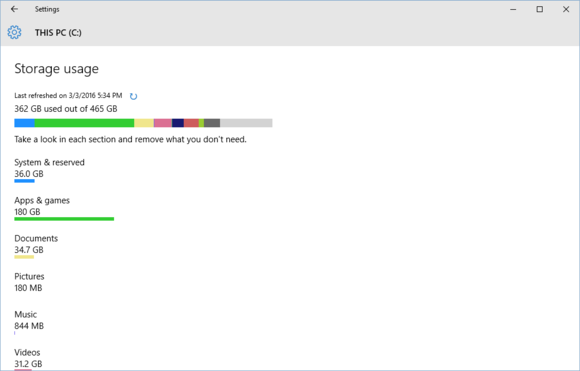 The new storage feature in the settings app can be a great way to quickly figure out where you can make space on your drive, but it’s effective only for higher-level folders such as Documents, OneDrive, and Desktop. To really get into the nitty-gritty of every folder and file on your PC, nothing beats embracing a good ol’ fashioned utility. Check out PCWorld’s quick tip on using WinDirStat to drill down even deeper into the files taking up space on your PC.